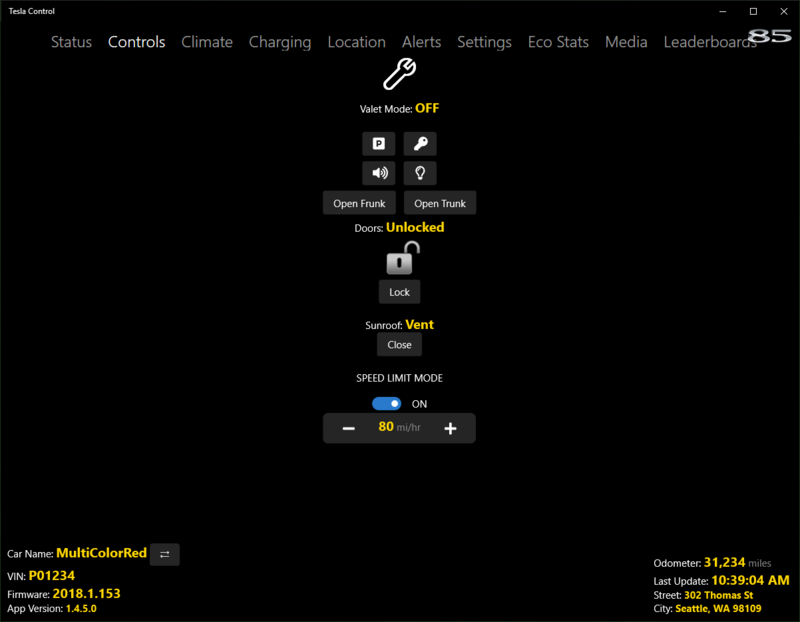 - Clicking this control allows you to Enable or Disable Valet Mode. Note: The current valet PIN is required. - Clicking this control remotely starts the vehicle. Once activated, the vehicle must be driven within two minutes or the remote start feature will time-out. Note: Tesla requires the user to enter the Tesla.com account password for this operation. - Clicking this control (if available) schedules a software update. You will be asked to specify the number of seconds to delay the start of installation. Note: Once scheduled you may cancel a scheduled update by clicking the control again. - Clicking this control Honks the car horn. - Clicking this control Flashes the car lights. Open Frunk - Clicking this control Opens the front trunk. Open Trunk - Clicking this control Opens or Closes (if motorized trunk is installed) the rear trunk. Lock Car - Clicking this control Locks or Unlocks the car. Vent - Clicking this control actuates the sunroof (if installed) to the Vent or Closed position. - Toggling this Enables or Disables Speed Limit Mode. Note: A PIN must be created or provided. This is not the same PIN used for Valet Mode. The speed limit can be adjusted upwards or downwards using the and buttons.